Although it is not an impossible scenario, it’s not just common for two storms to form before the actual hurricane season and this appears to be the case this year. 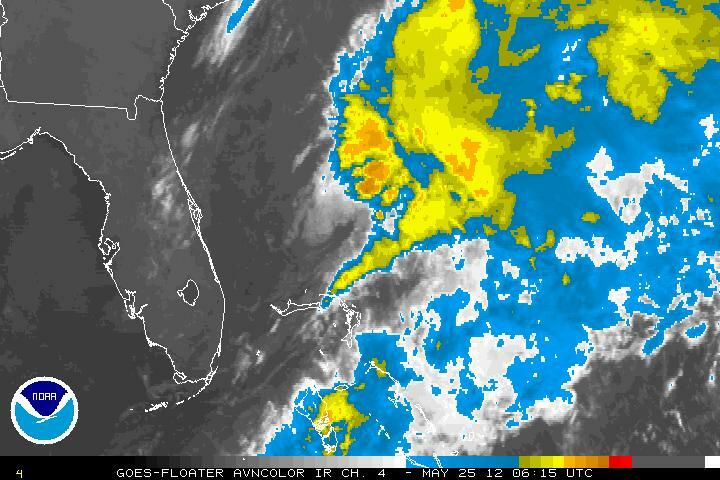 We already had Tropical Storm Alberto and now Invest 94L was becoming much better defined and thunderstorm activity near the center has been on the increase. As of the 11PM last night, Invest 94L has been upgraded to Sub-Tropical Storm Beryl. One difference between the two storms is that Tropical Storm Alberto was small is scope but Beryl has a very large moisture shield to play with. A deep layer trough near the Mississipi Valley will travel northeastward creating a ridge which will limit any chance of Sub-Tropical Storm Beryl heading out to sea. All the global models are in agreement that Beryl will continue a west to southwest trek toward the southeast coast between Georgia and northern Florida. 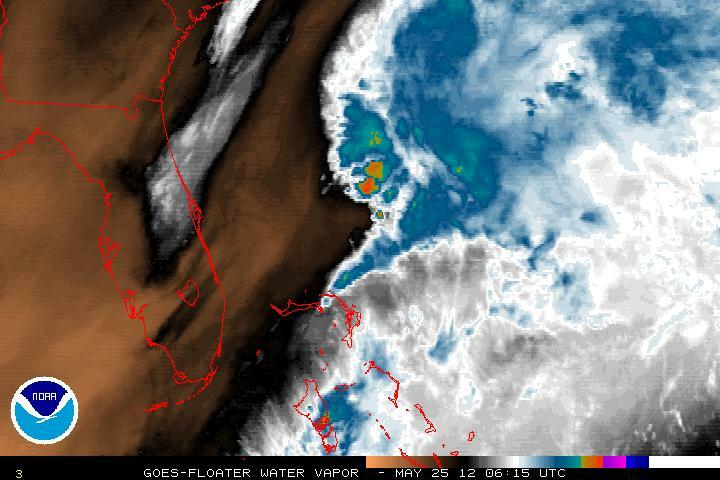 Currently the thunderstorm activity has been away from the center of Beryl, thus keeping the storm classified as a sub-tropical. The SST’s in the Gulf Stream are in the 26°-27° Celsius which may allow further strengthening. One major factor in the intensity forecast is the fact that Beryl is having dry air entrainment from the west and south. Another major factor will be northwesterly vertical shear, limiting development. One possible plus for development is that the landfall area is in an area where the coastline is curved. The curvature can sometimes enhance convergence and may help the chance of Beryl strengthening just before landfall. Once landfall has happened and the blocking ridge moves away, Beryl is forecast to turn east-northeast and accelerate back into open waters although there are differences within the models as to how far inland the storm get before curvature happens. The GFS and HWRF feel Beryl will come inland a couple hundred miles where as the ECMWF wants to turn Beryl near the coastline. 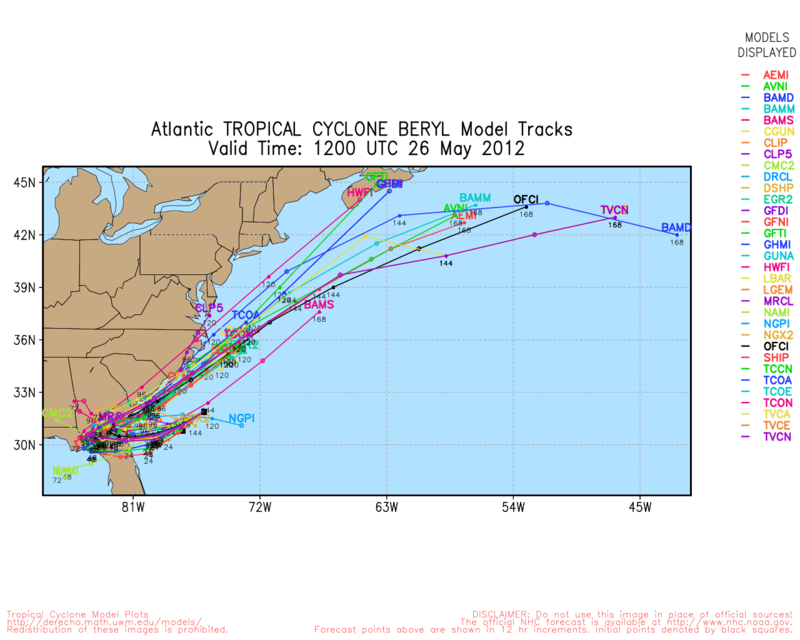 There is the chance that Beryl may go though the transition from sub-tropical to tropical. The one positive with Sub-tropical Storm Beryl is that the northern Florida and Georgia are currently needing rainfall. Hopefully the rainfall amounts will help but not too much as to flood the areas affected.